Agnews, Baines, Be Modern, Capital, Calfire, Cast Tec, Focus, Focuscast GB Surrounds, Parkers, Stovax, Taylor Made, Warm Home and many more. Fireplaces can create a real WOW factor in your room. The materials used are varied and with so many styles to choose from it can be a minefield, but that’s where we can help. 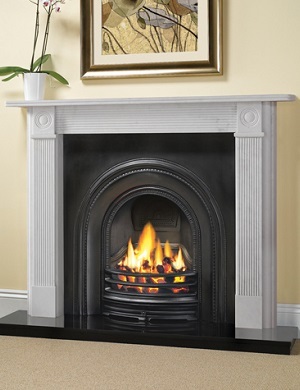 Limestone or marble is always stunning, especially when combined with a black granite or slate hearth. Being a natural stone you may get a variation in colour or even the odd small fossil, which will make your stone fireplace unique. Portuguese limestone is beautiful and depending on the area it has been mined from, will have either light or heavy veining. Again your fireplace will be unique. The same is true of natural marble, whilst our stonemasons make every effort to use only the best pieces of stone, they can never guarantee that they will be without a geological imperfection and this will again make your fireplace unique. There are some stunning timber surrounds available in a variety of different designs or woods and we are also able to offer a made to measure service with many of our models. Whether you want to restore a period house to it’s former glory, or create an authentic look for a modern room, there is a cast iron fireplace or insert to suit you. If you need to restore your existing cast iron fireplace, we stock a wide range of reproduction canopies and front bars, along with a vast choice of reproduction tiles and cast panels. We also have a selection of restored original cast iron fireplaces and tiles. There are many ways of creating the correct look and your choice of hearth material is very important to complete the picture. We stock many different sizes and materials. From natural materials like granite (polished or honed), slate (polished or riven), together with limestone and many different colours of marble. You may want to choose tiles for your hearth and again we are here to help you. We stock a large range of tiles from plain, to various textures and shades, including wood effects. Glass hearths are another option and these give a more contemporary look, which is very popular with a freestanding stove. These are also available in many sizes, shapes and colours. 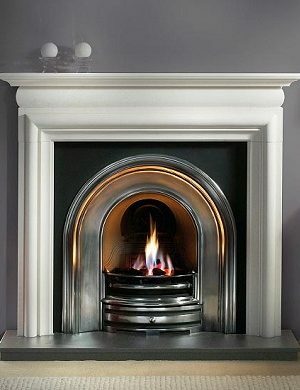 We also have very modern ‘hole in the wall’ type fireplaces, in many different sizes.